Good morning. Thanks for stopping by today! I hope you've had a good week of reading. I personally haven't read much this week, but I did get a couple reviews written. 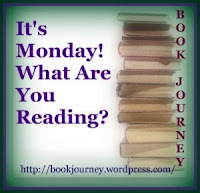 I reviewed Girl with a Pearl Earring by Tracy Chevalier. I had mixed feelings about this one. You can click on the title to read my review. I also reviewed Drinking from the Fire Hose: Making Smarter Decisions without Drowning in Information by Christopher J. Frank and Paul F. Magnone. This is an excellent book for anyone who has to make big decisions or present data at work. I'm still reading Off the Grid by Mark Young. I'm enjoying it but I just haven't had a lot of time for reading this past week. I changed up what I'm reading next because I have a book tour coming up, so I'll be reading Blue Asylum by Kathy Hepinstall next. I had too many book tours this month, looking forward to less commitments in May and reading some that have been shouting from my shelf. I haven't read anything by Tracy Chevalier yet. She's on my list of authors to read.